Camahogne, was what the Carib Indians called their island. The Caribs took over the island from the original inhabitants, the Arawaks. It was Christopher Columbus’s third voyage to the New World, in 1498, when he discovered and named the islands “Concepcion”. The sailors of his fleet changed the name to Granada, as it was a better reflection of the beauty they found there. This island nation is made up of the main island, Grenada, and six other smaller islands, located in the southeastern part of the Caribbean Sea. She is small, at only 133 square miles and a total population of less than 110,000. Grenada’s neighbors are Barbados to the east, St. Vincent and the Grenadines to the north and Trinidad and Tobago to the south, along with Venezuela. 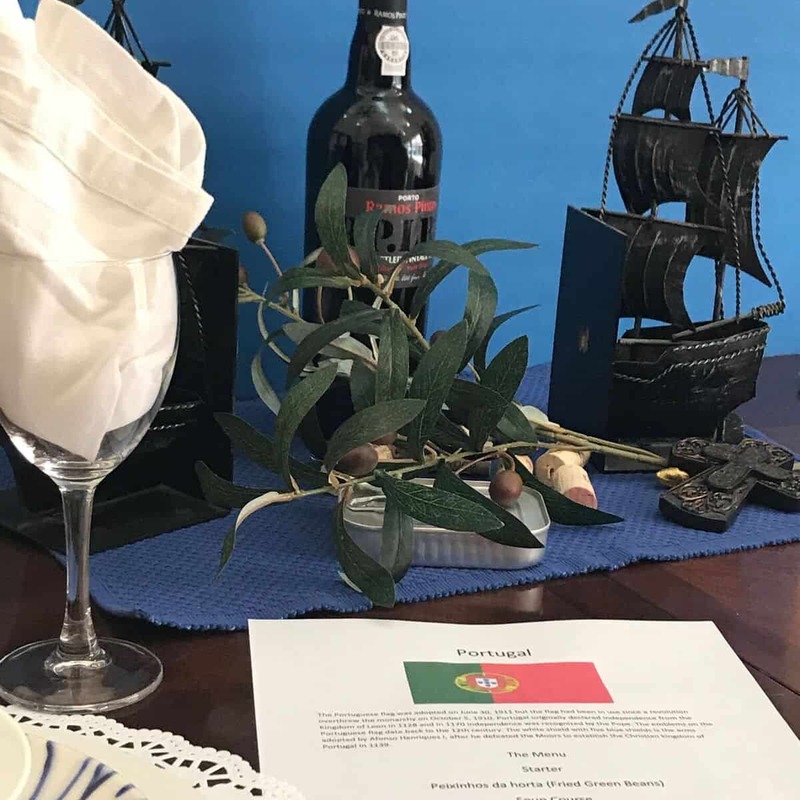 Although Columbus discovered the islands, it was the French that first colonized them; arriving in 1650 and then changed the name from Granada to “Le Grenade”. In a long and bloody campaign, most of the Caribs were annihilated. The few that remained, planned an attack on Fort St. George, in the capital city. The Caribs were chased to a steep, seaside cliff and when they realized they had no escape, they jumped into the sea. All of those who jumped perished and the point was named “Le Morne des Sauteurs” or Jumpers Hill. The rich, fertile, volcanic soil was in high demand and the British and French fought over the territory for ninety years. The French finally gave up control after signing the treaty of Versailles in 1793. The British named the island Grenada, (pronounced Gra-NAY-da) and the name remains today. The British wasted no time in maximizing their sugar plantations on the island. African slaves were brought over to work on the plantations. Britain finally abolished slavery in Grenada in 1834 and Grenada gained her independence on February 7, 1974. Today, Africans make up the largest ethnic group on the islands. Today the country is run as a parliamentary democracy, with the Queen of England as the Head of State. Back in 1983, Grenada was seized by a Cuban trained, Marxist, military council, who executed the Prime Minister, Maurice Bishop, along with other members of his cabinet. This, together with evidence that they were building a runway equipped for large military equipment, prompted President Ronald Reagan of the United States to take immediate action. He deployed troops and almost overnight, toppled the Marxist Regime. Democracy was restored. October 25th is celebrated each year in Grenada as Thanksgiving Day; as they have remained a peaceful society ever since. The main religion on the island is Christianity; mostly Roman Catholics and Protestants. Many holidays and festivals revolve around the Christian holidays. English is the official language of Grenada, although it is spoken with a creole twist. They also celebrate Carnival, in August. This is a huge, street festival with masqueraders dancing to the sounds of steel bands and DJ’s playing that Calypso rhythm, so popular in all of the Caribbean. Grenada is referred to as “The Spice Island”. 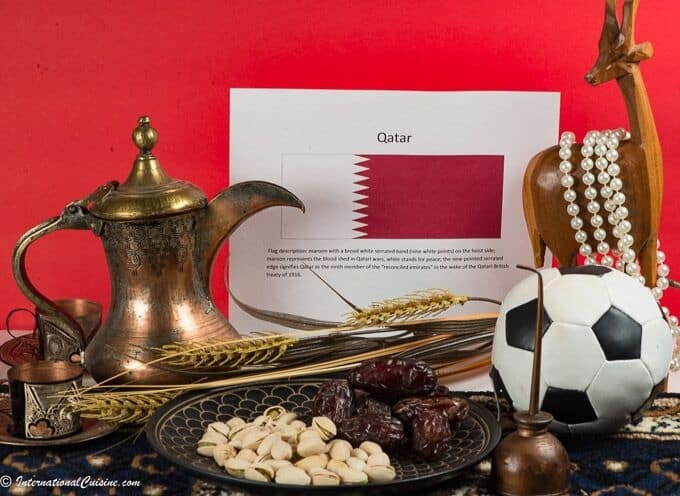 They are the second largest exporter of nutmeg in the world, behind Indonesia. They also export cinnamon, mace, allspice and cloves. The intoxicating aroma of spices is said to linger in the air. Organic chocolate has become a new valuable commodity. They grow the cocoa and process the chocolate on the island. It is in high demand, from some of the best chocolatiers in the world. Grenada has had very few hurricanes in her history. However, one that hit the island, causing nearly total destruction of the crops and infrastructure, was Hurricane Ivan in 2004. After losing ninety percent of the crops, Grenada focused heavily on tourism to diversify their economy and it appears that they are doing quite well. Beautiful beaches with pristine snorkeling and diving, amazing hiking trails, with countless waterfalls, are all popular attractions in Grenada. After losing most of their coral reef in the hurricane, an artist by the name Jason De Caires Taylor, designed an underwater sculpture gallery. It lies 24 feet below the surface and houses 79 sculptures in all. It is a man-made reef, in essence, that has become part of the underwater plant and animal refuge, serving as a safe haven for wildlife. Another attraction there is the oldest rum distillery in all the Caribbean, still in existence. And oh how the Grenadians love their rum punch, with a light sprinkling of their sacred nutmeg. As we look into the cuisine of the small island nation, it is clear that the main culinary influence comes from what is grown on the island, combined with the traditions of her people. All types of tropical fruits are found there and they are part of the everyday diet, in juices and fruit salads. They are also the basis for the many flavors of rum punch. Their staple produce includes: corn, beans, avocado, sweet potato, breadfruit, taro and plantains. Meat is available, mostly chicken and pork, along with an abundance of seafood. The national dish is called “oil down”, a stew, consisting of pork parts and salt cod, along with breadfruit, carrots and dumplings all of which are slowly simmered in an array of spices and coconut milk. This process usually happens over the course of the day and best enjoyed with family and friends, especially when made on an open fire at the beach. So let’s enjoy a Grenadian meal! What better way to begin a festivity than with calypso music, playing that tantalizing, rhythmic beat in the background? We lit scented, spice candles to emulate that enchanting fragrance of “The Spice Island.” We decorated with a variety of tropical fruits and spices. Bougainvillea is their national flower and made for an exquisite décor, along with a few palm fronds. We also placed a small box holding two white doves in honor of their national bird, the Pea also known as Well’s dove, which, sadly, is endangered. We sat down at the table and lifted our glasses of rum punch with “Cheers”. Our first course was a simple fruit salad, made with orange, papaya and banana, topped with a little grated nutmeg. 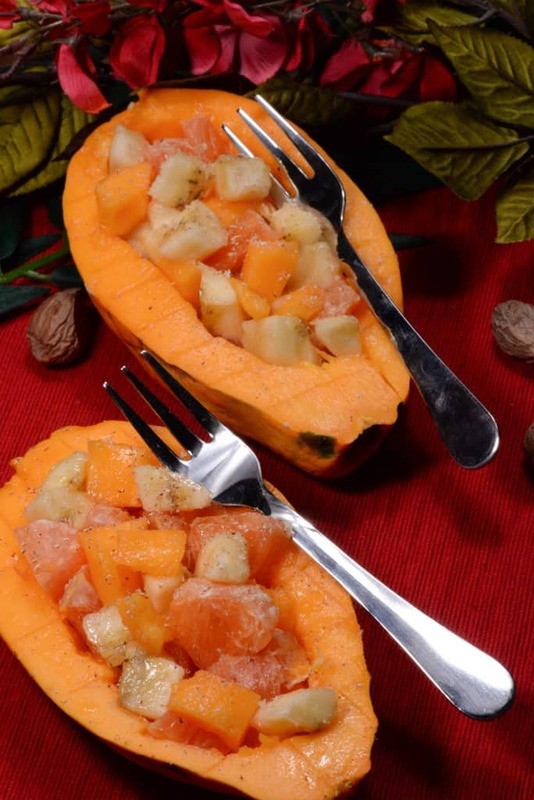 I so love the fresh citrusy essence of freshly, grated nutmeg and it was perfect on the fruit. Next was the main course; a real treat. The combination of flavors of the roast pork, with a distinct orange and spice flavored sauce, served over spinach, was sublime. 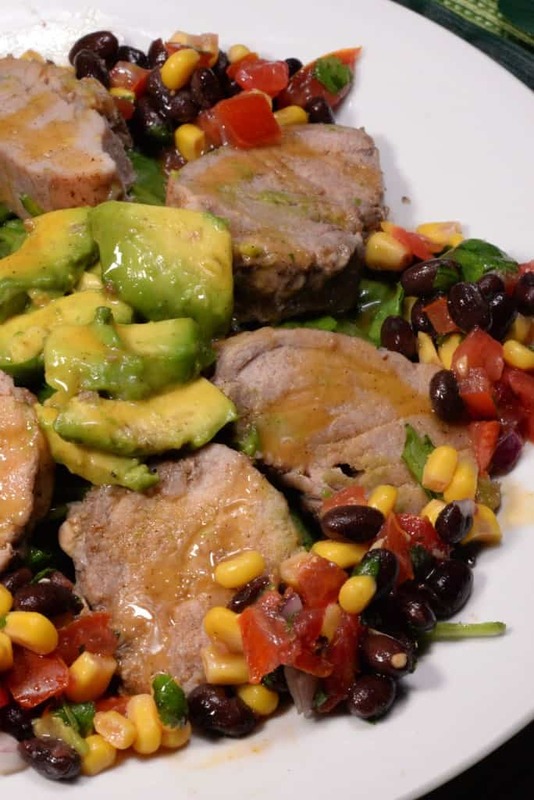 This was accompanied by a black bean and corn salad, accented with a light lime dressing. This colorful, cold, salad was amazing and one I will make often. It was simple and delicious. 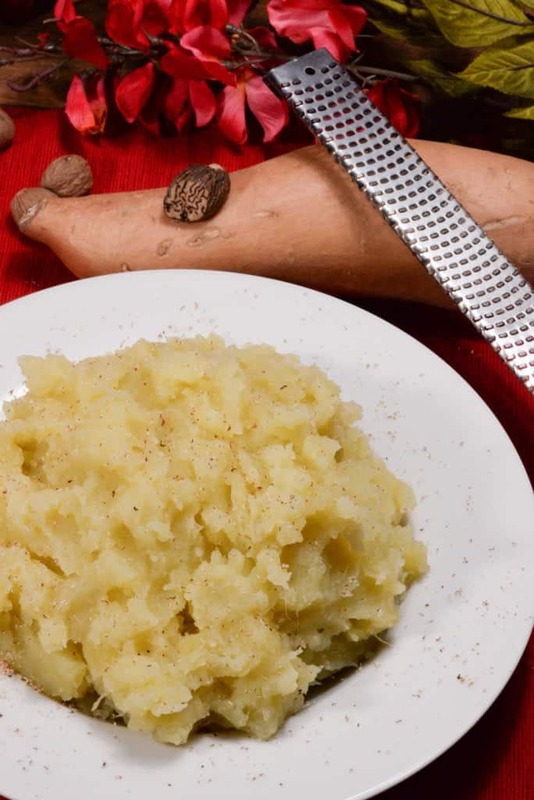 Another incredible, side dish was the sweet potato mash, flavored with all the tantalizing Grenadian spices. 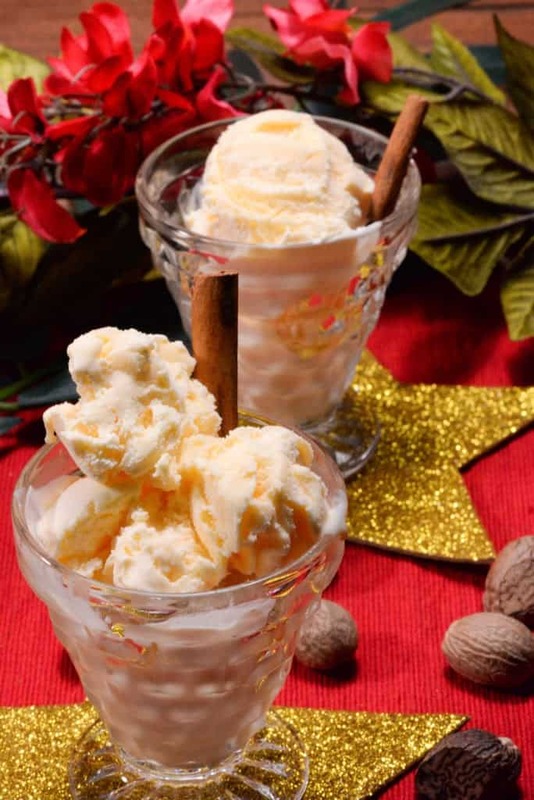 For dessert, we savored homemade, nutmeg, ice cream. This ice cream can be found all over the island. 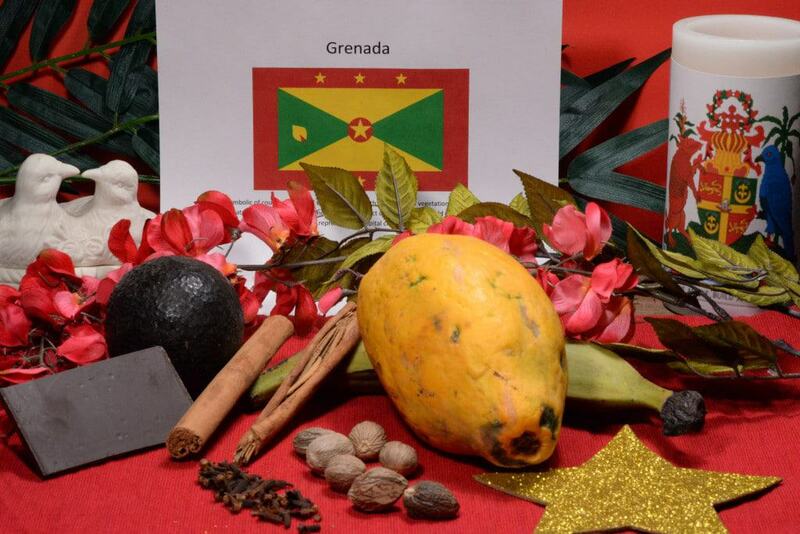 Nutmeg is the pure essence of Grenada and even their flag proudly displays it. As we say goodbye to the tiny Island nation, I leave you with a few, fun, local words and sayings. We are off to learn how to play cricket; a much loved bat and ball game in Grenada and where the 2007 Cricket World cup was held. Vrooping =Jumping from here to there. Study your head = watch out what you’re doing. It was great catching up with you Mary. Dan and I look forward to making it up to the Captns Table. So happy to have you on the Journey!